Image: Sander van der Borch. Adam May was one of the key team members along the entire shore & part of the design crew on transforming the failed floating concept of Artemis first version to a foiling AC72. The work done on such short time was truly impressive, achieving first an 'out of the box' fast & stable flight on AR AC45. Experience later translated to Big Blue that also showed great potential, but of course with so little time the sailing team couldn´t manage to take full advantage of the new flying platform. Team owner has taken notice, and has confirmed May along Nico Rousselon, signing also new talents coming from OR & NZ in past campaigns. Full press release below. Interesting remark from Törnqvist on the need of working together over supposedly leading edge tech. Imagine what this team could have achieved on the work done in the last weeks of the Cup at SF if that drive and common sense showed were present since day one in their AC34 Campaign. 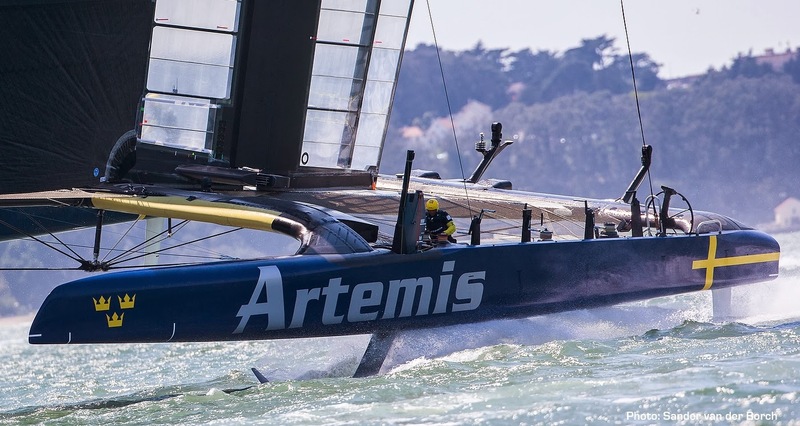 Artemis Racing has signed designers Michel Kermarec and Thiha “Winnie” Win, who will join returning designers Adam May and Nico Rousselon, as the team prepares a possible AC35 bid. Michel brings a wealth of experience to Artemis Racing, having served as a key member of Oracle Team USA’s design team during their AC33 and AC34 victories. He specializes in performance prediction and appendage design, and holds a PhD in hydrodynamics. Michel is a talented sailor, and represented France in the Soling class at the 1988 Olympics in Seoul. ng projects all over the world in both marine and non-marine industries. After a very successful period in motor sport in the early 2000s, he turned his attention to America’s Cup yacht design in AC32, with Luna Rossa Challenge. Winnie was a key member of BMW Oracle Racing’s design team during their victorious AC33, and was part of Emirates Team New Zealand’s successful AC34. Nico, a specialist in aerodynamics, graduated from Southampton Institute in 2004 with a BEng in Yacht and Powercraft Design, before specializing in Computational Fluid Dynamics with an MSc at Southampton University. In 2007, he integrated the Cape Horn Engineering (then CFD branch of Juan Yacht Design) to start the aero side of the company. His skills were further developed through two Volvo Ocean Race wins (Ericsson4 and Groupama). Adam competed for Great Britain at the Sydney Olympics in the Tornado class, and is an aeronautical engineer by trade, having worked for Airbus UK in their wind tunnel and design office. He was a technical coach for TeamOrigin and Skandia TeamGBR, working closely with Iain Percy and Andrew Simpson during their successful 2008 and 2012 Olympic campaigns. Adam was part of the AC32 Victory Challenge team, before joining Artemis Racing for AC34. Artemis Racing continues to assess the criteria for the next America’s Cup, and is in the meantime building a winning team based on experience, talent and collaboration, and looks forward to making additional team announcements soon.